Synopsis: “Alex the Lion, Marty the Zebra, Gloria the Hippo, and Melman the Giraffe are still fighting to get home to their beloved Big Apple and of course, King Julien, Maurice and the Penguins are all along for the comedic adventure. Their journey takes them through Europe where they find the perfect cover: a traveling circus, which they reinvent – Madagascar style” (United International Pictures). Verdict: Perhaps the first film franchise ever to have started off really poor before having improved sequels one after another. 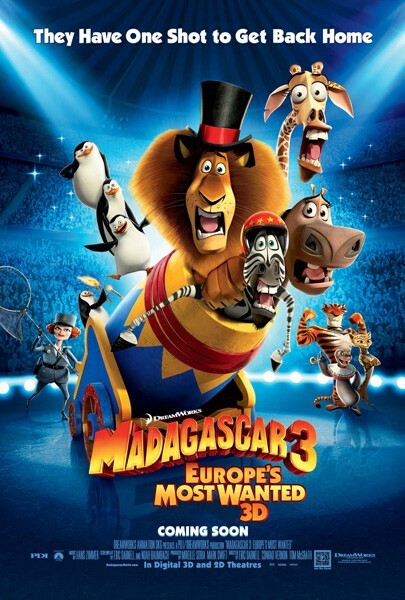 Madagascar 3: Europe’s Most Wanted is senseless and very forgettable but its fast-paced nonsensical fun is quite an entertainment. I’m particularly impressed with how the cartoon pulls off spoofs on a number of common movie cliches without overemphasising. It’s also admirable that they pay tribute to circus, a form of great entertainment that’s no longer as appreciated as it was. However, except for the antagonist, all the other new characters are relatively boring. Dubois (Frances McDormand) is probably the most competent villain I’ve ever seen on a comedy. Second opinion: “Liked it, stupid but funny” (Iris Loong, who didn’t know that the Afro Circus melody was actually taken from the universal circus theme music). To watch in 3D? Yes, I think it should be pretty great in 3-D for some of the scenes. What’s next? Madagascar in Asia could be interesting. Favourite and least favourite scene: The part where the characters perform their new circus act. I liked it ’cause the scene is very well choreographed. On top of that, it manages to make a rubbish song like ‘Firework‘ (by Katy Perry) sound good. But after sitting through the entire midsection of the film, I wasn’t expecting such a short performance. Would you pay to go to a 3-5 minute circus show and be satisfied? Thinking of going to watch with my daughter today. Looking for light-hearted entertainment, no need to think too much…just relax and enjoy. @kenwooi Kids wouldn't catch the little spoofs on common film cliches. Plus, it's rated P13 by our censorship board. @EricLee Well, we can't complain about exaggeration when the animals can already talk on the film. The circus perform is fun but too short. i need to watch the earlier ones before i catch this. somehow i have never sat through an entire madagascar movie. i wonder why?